Fifty-five pupils at Kinross High School engaged in our build-a-plane project. 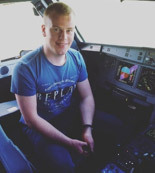 We are very grateful to Air Services Training at Perth Airport who, at the start of the project, introduced pupils to the aviation specific aspects of health & safety and the fundamental practical skills around tool control, engines and electrics. We selected a Eurofox two seat aircraft for assembly under the auspices of the Light Aircraft Association. Two “Flying Class” shareholders travelled to the factory in Slovakia where our kit was manufactured. The kit was subsequently delivered to a temporary workshop at the Loch Leven Community Campus on 24th November 2017. Assembly was led by a small team of adult amateur builders and pupils were given the opportunity to learn about simple aircraft design and kit assembly. On 8th August 2018 the new aircraft (“G-OASK”) passed its initial flight tests. The intention is to give pupils from KHS and the surrounding area free air experience flights commencing in the Spring of 2019. Like most pilots of a certain vintage I got the flying bug in the Air Training Corps when I achieved my Gliding Certificate, by going solo in 1968. 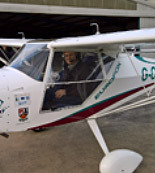 I subsequently flew at Strathaven Airfield and The Scottish Gliding Centre where for several years I was a Basic Instructor, introducing a wide range of people to flying by air experience flights. 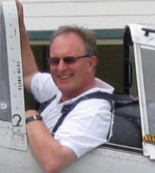 Several years ago I converted to power and obtained my National Pilots Licence. I have over 400 Hrs gliding and 250 Hrs power flying. I am now retired, married and have two grown up children. 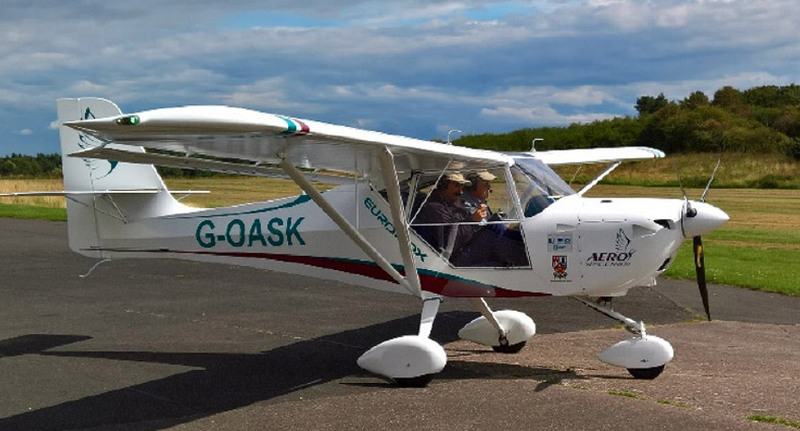 I was one of the main people involved in the building of our Kinross High School ,Build a Plane Project, The Eurofox aircraft G-OASK and I now look forward to flying her and introducing other people to the joy of flight. I’m 29 years old. I grew up on a farm in the Scottish Borders and went to school in Edinburgh. Since then, I’ve been living in England – first, studying Astrophysics at Cambridge University and then working for a fintech start-up in London for six years. I started learning to fly as a hobby at Elstree Airport North London in 2016. It was a great way to escape the big city for a couple of hours each weekend and I love the fact that it gives you a completely different way to travel. I qualified for my PPL in August 2018 after just over sixty hours. 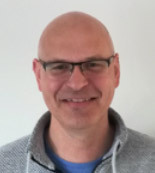 I’m a graduate from the University of Aberdeen with an MA Honours in Economics and I work for a global manufacturing services provider as a Supply Chain Project Manager. 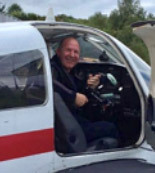 I trained for my Private Pilot Licence at Fife Airport with Tayside Aviation, flying the Piper PA28-161 and my long-term goal is to obtain a Commercial Pilot Licence. 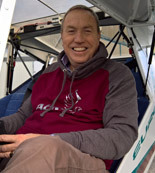 I’m an active member of the Fife Flying Club, where I have sat on the committee for the last 2 years and have helped to organise a number of events. Most notably, I have been involved with the annual Fly Kids Day, which provides children with special needs and disabilities the opportunity to experience the joy of flight in a light aircraft. Hello, my name is George Ross. I am employed by a global FM company to provide tech services to Edinburgh city council. Married with three grown up sons and two lovely granddaughters, I live on the east side of Edinburgh. My first flight experience came when I was 14. We lived in a farm cottage in East Lothian where the farmer owned a Tiger Moth biplane. Eventually after years of pestering he finally gave in and agreed to take me flying, I can still remember the smell of the leather, the fuel and the oil when the engine was roaring into life, there was no radio or intercom so he would whack me with a cane to get my attention and shout for me to sit down as I was jumping up and staring over the sides at the countryside whizzing by, the wind blasting in my face, tears running from my eyes my smile was ear to ear, what a feeling! Memories that have stayed with me all these years. Our family owned the local petrol station which carried out repairs to all sorts of vehicles, so from an early age I have been involved in working with tools and doing all sorts of jobs, I would go to the garage after school and help with fixing cars rather than play football like the rest of my school chums. It was no surprise to everyone in the village that at seventeen I wanted to have flying lessons, so I cycled every Saturday to Turnhouse flying club from East Lothian with my whole weeks salary to pay for a lesson, this carried on for two years until I had gained the skill and knowledge with patient instructors to become a pilot, in those days we even learned Morse Code as part of the study. P.T.H was the ident code for the Perth VOR. I have over 4000hrs flying experience and would honestly say I loved every minute. I am a retired senior banker who came to live in Kinross-shire 18 years ago to be closer to the Scottish Gliding Centre where I was formerly Treasurer. In my current voluntary role as Chairman of the Kinross-shire Partnership, I came up with the idea of creating Aero Space Kinross to inspire future generations and to create jobs in the local area. I started flying at the Southdown Gliding Club over 30 years ago, and have 300 hrs gliding and 200 hrs experience in a Touring Motor Glider. I am married with 2 grown up children. I worked in the gas industry in various roles for 25 years but left to start my own company 10 years ago. I am a keen cyclist and active member of Glasgow Green Cycle Club. I served in the children’s reporter system (the Children’s Panel) for 5 years in Glasgow’s East End. I took up flying 2 years ago and did my training at Cumbernauld airport where I now lead a private aircraft ownership syndicate. 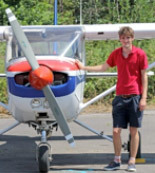 At school I couldn’t decide between being a vet or a pilot….so I chose vet and now fly for fun. I started with the Air Training Corps in gliders and Chipmunks and did a Flying Scholarship at Perth in 1972 on Cessna 150s. 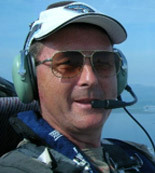 I have flown 30 different types of glider and aircraft and have over 500 flying hours in total. I’m looking forward to helping kids get involved in aviation, whether flying or in the related STEM subjects. Not sure how I’ll fit the vet experience in…..perhaps we could do breed identification of cows and sheep from the air?…there must be a need for it! I have over 33 years of experience as a mechanical engineer, 28 years of which was spent in the RAF. During my time in the RAF I worked on many different aircraft types, starting in the Puma and Chinook helicopter maintenance hangar, before moving to Germany to work on Harrier jump jets. Over the rest of my service in the RAF I worked on all the different types of Tornado, Tristar, VC10. I retired as a Chief Technician for the mechanical engineering trade in 2014 while working on the Typhoon. I am currently the engineering team leader heading up the preventative maintenance department for Scott-Fyfe industrial textiles in Tayport.